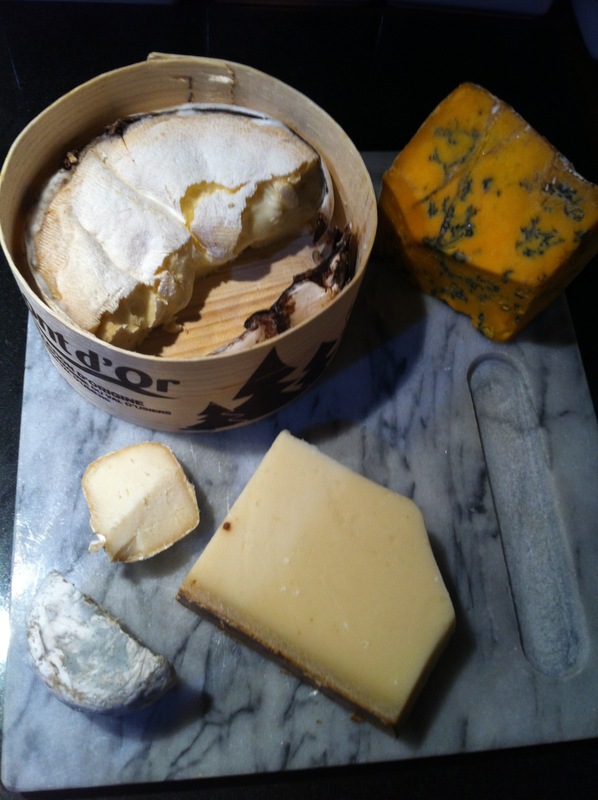 On the top left is the Vacherin Mont d’Or, a really gorgeous, unctuous cheese wrapped in spruce bark. You can really taste the resin in the cheese around the edge, but the middle is much creamier which makes a lovely contrast. To the right is the Shropshire Blue – really intense and earthy, but with none of the harshness that blue cheese can have. Oddly, it goes really well with cinnamon biscuits. On the bottom left is the Crottin de Chavignol, probably my least favourite of the selection. It’s a nice, hard, well flavoured goats cheese, but the rind has a mushroomy flavour which doesn’t really work for me. The last one is my favourite – the cave aged Premier Cru Gruyère Von Mühlenen. It’s a fabulously intense and savoury flavour, but with a slightly nutty sweetness too. Complex and glorious – I can see why it’s been named world champion cheese three times!